I think the timing for this recipe is perfect, considering the below freezing temperatures we’re putting up with in Chicago. I came home today with a frozen face and hands thinking, what can I eat/drink that will defrost me and keep me warm? First I thought hot chocolate, but then reason kicked in and I rushed to the freezer to take out some frozen chicken and make soup for dinner. I didn’t even wait for the chicken to defrost. I just popped it into a pot of water and put the flame on high. You can make this as quick or as time consuming as you want, but here’s how I usually do it, because for some odd reason I never plan ahead for soup, I just have a sudden craving and don’t have time to make it a tedious and time consuming recipe. Add the chopped chicken into the water along with the half cube of chicken stock if you have it. It’s nice to add for some extra flavour, but not necessary. Bring to a boil and simmer for a few minutes, then add the vinegar. This depends on how sharp you want the soup to be. I usually start with 3 T and add more if needed. Now add in the shredded veggies. You can even use those pre shredded cole slaw packets (but I think the cabbage in those packets tastes a bit stale). Once the soup comes up to a boil again add the seasoning and soy sauce. Again, with the soy sauce, I start with 2 T then add more if needed. Then in a small bowl mix the corn flour with just enough water to make a thick paste and pour it into the soup, mixing so no clumps form. Let the soup simmer for a couple of more minutes, then pour in the beaten egg without stirring. Once the egg starts cooking it will rise to the top, and then you can stir to break it into pieces. 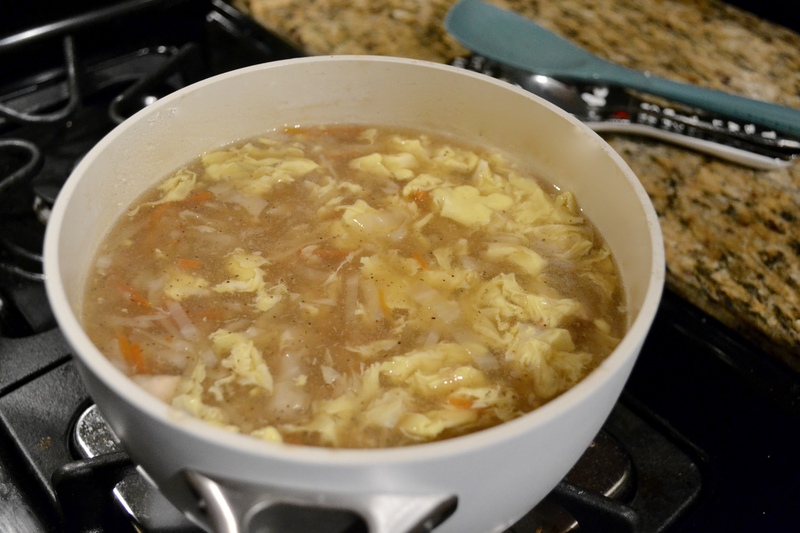 If you prefer smaller pieces of egg you can stir while adding it into the soup. That’s all! Serve with garlic bread and enjoy! You can also make this with homemade chicken stock, or store bought chicken stock as well.